August is traditionally the silly season in the media, as journalists and readers/viewers take advantage of the summer weather and holidays (well that’s the theory) and disappear, leaving space for all sorts of outlandish reporting attempting to fill column inches, airtime or pixels. Old favourites -rip off Britain springs to mind where random products in random stores across random countries are compared at seemingly random currency rates – are taken down, dusted off and retreaded to serve again. So it was no surprise when I read the headline that Lidl were testing a loyalty scheme in Scotland. Outrageous, silly season stuff. But actually, no. The roll-out of the loyalty scheme (a world’s first for Lidl apparently) had passed me by. Plastic cards and key fobs had been sent out to homes in promotional fliers and inserts. Yet perhaps because we live near to a Lidl we tend not to focus on these, but rather go in to the store as and when. But it is true, Lidl have a loyalty scheme on trial in Scotland. They have launched a card based scheme as a 10 week test in Scotland (apparently due to the density of the store network). Customers get a card and use it when they shop, with the reward varying each week. The initial benefit was £5 off £25 shopping over a two week period. To access the rewards and details you need to use the card in store. This step by Lidl is of interest as it is a foray into the broader realms of loyalty. 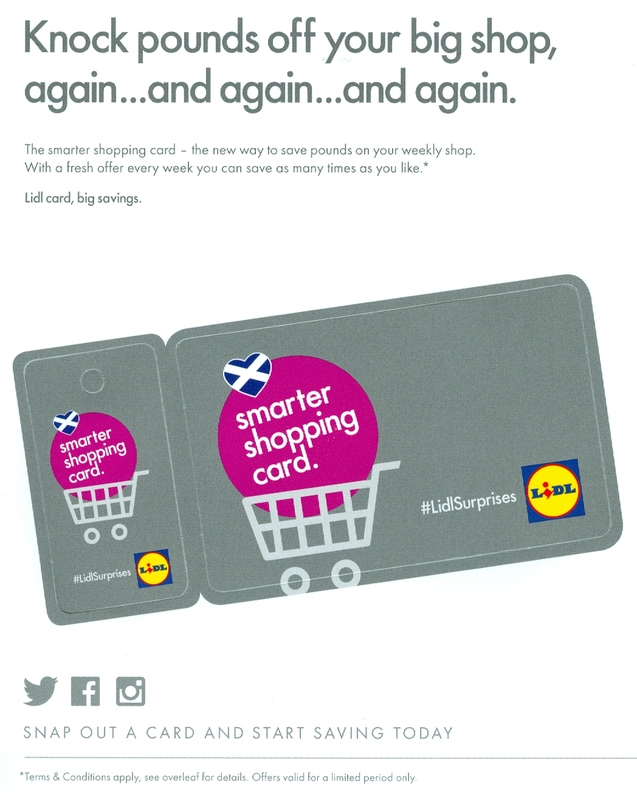 Discounters always tend to argue that loyalty comes from low prices and not from gimmicks such as card schemes, and indeed Lidl took out full page advertisements last year poking fun at Morrisons launching their loyalty scheme. But here we are with a Lidl card. But Lidl also deny that their approach is a loyalty scheme and nowhere on its leaflet, promotion or card is the word “loyalty” to be found. They take the position that as they collect no personal data then it is not a loyalty scheme. True Believers in loyalty might be tempted to agree with this. But hmmmm. If the aim is to get people to come to the store regularly and often and to get them to choose Lidl over other retailers more often, then it is walking like a duck called loyalty. Maybe it is just not a good loyalty scheme from the point of view of the retailer long-term. So, it all suggests that Lidl are concerned about their growth and about customers’ behaviors and are seeking to see if they can address the issue by experimenting and trialing. This indicates a degree of pressure beginning to emerge in this end of the market and that the reactions from competitors (mainstream, discounters and bargain entrants) are having some impact. Whilst growth is still well ahead of the market, it has slowed a bit, and there may be questions of growth rate sustainability emerging, especially so if all the planned store openings across the wide discount segment are taken into account. It is way too early to call the end of the discounters growth, but life may not be as simple (it is never easy, especially at this end of retailing) in the future. So, a Lidl Surprise for Autumn, but it may not be the last one. This entry was posted in Discounters, Food Retailing, Lidl, Loyalty, Loyalty Schemes, Market Shares, Scotland and tagged Discounters, Food retailing, Lidl, Loyalty, Market share, Morrisons, Scotland. Bookmark the permalink. 2 Responses to A Lidl Surprise? Well Lidl maybe have a way to go? Said the London Times Wine correspondent last weekend: “I still find Lidl stores a mess, with wine randomly lined up on shelves or left in boxes, hopeless signage… a lack of staff and long queues” (and more). There again, I’d have to say that the one big new Lidl (at Cambuslang, Lanarkshire) I’ve tried out is nothing like that. Meantime we’re harvesting the many ‘reduced to clear’ big bargains to be had at local Tesco; presumably part of the drive towards the greatly reduced lines offer as Tesco seeks to adapt the discount stores model? The Mumsnet tie up is interesting and I suspect is about brand trust strengthening. My feeling is that discounters suffer more from operational variability than do the larger chains; some are great but others have issues. But what the LT Wine correspondent describes is part of the operating model for Lidl. Cost is controlled by reducing merchandising and staff as well as reduced lines and good buying. Tesco is clearing out a lot of lines and there are bargains to be had. But it will not get down to anywhere near the line number of a discounter. An issue to watch will be if it cuts too far in comparison with the choice at others.